School comes much to quickly anymore, it's Back to School before summer is over! The school year means a lot to us because all of our children work in a school system. Our two boys (who are grown men now, but will always be my boys!) are teachers. Shawn is a middle school science teacher and Thomas is a high school government and history teacher. Our soon-to-be daughter in-law, Jenna is a pre-school teacher which is run through the school as a head start program. She works with the real little ones! works in the schools with children that need some special assistance. The chalk board above is for the girls, more in line with their students. The chalk board on the reverse side is for the guys. If you didn't do your homework, just admit it and get it done. I love hearing their teaching stories. I also loved the fact that three out of the four had the summer off so they could come and visit us at the lake this summer. As our clock says - they are welcome to come and get some R&R at the lake anytime! But it is back to school for all of them now. I hope those of you who do have children in school have a nice start to their school year. And for all you teachers out there, know that you are greatly appreciated by so many. Thanks so much to those of you who take the time to leave a nice comment, they are always appreciated. This is absolutely adorable and the color palette is perfect. Thank you for the inspiration! This is so cute! The colors and patterns play off each other beautifully. 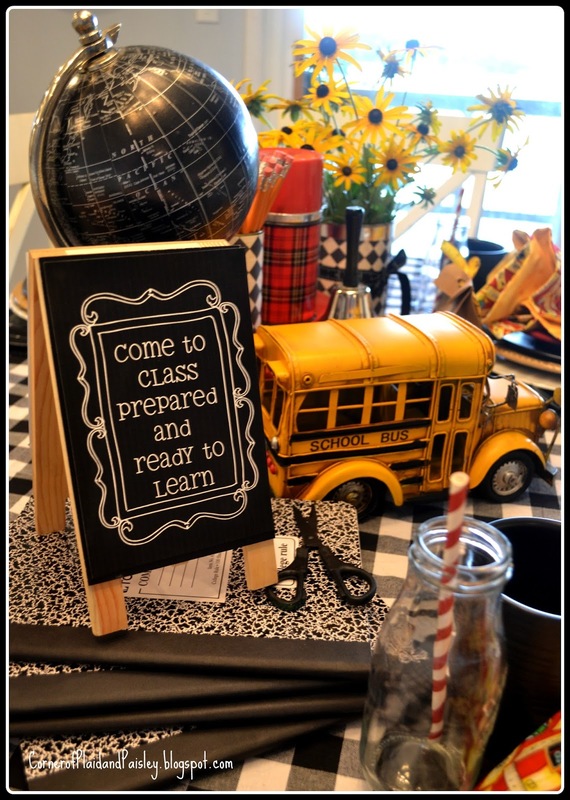 All the school-related items in the centerpiece are perfect. Motivating and fun! 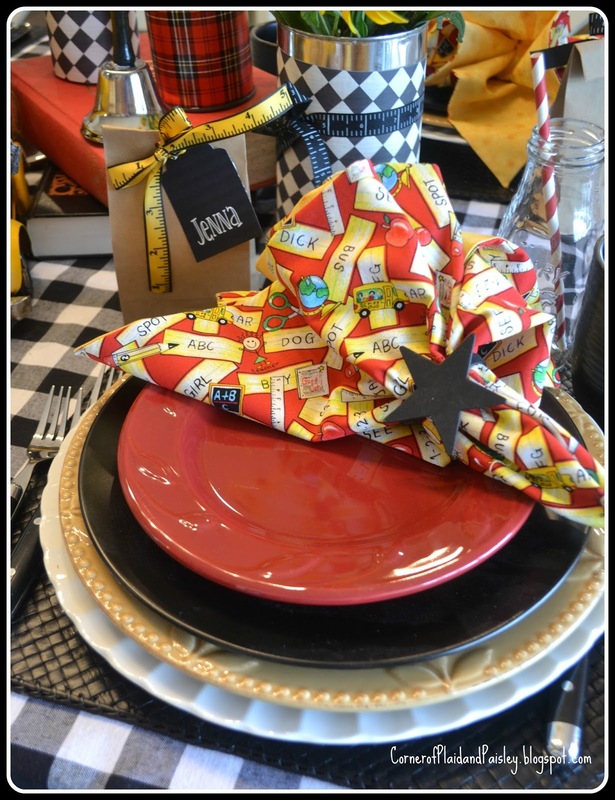 How perfect is this tablescape?! From the fall colors to the lovely fabric napkins, to the globe and that incredible bus! Fabulous! 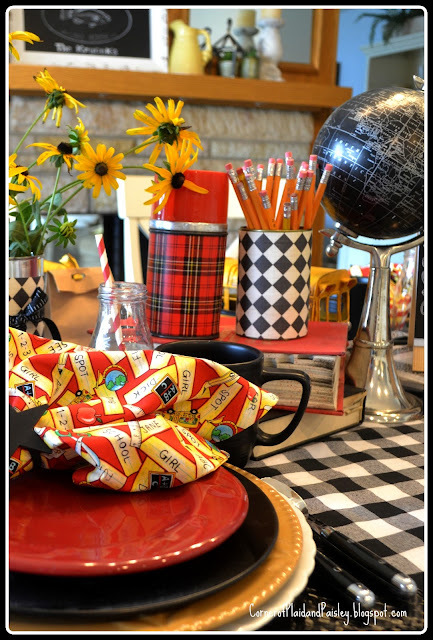 I had a plaid thermos just like yours back in the day. This is lovely and inviting. Great job! I love this tablescape Ann! It reminds me of days gone by and makes me want to go back to school! So creative! this is perfect! This is a very special table for those children returning to school soon. Well Done. That little chalkboard needs to be mass produced in billboard size and hung throughout the nation. The "homework" could apply to office workers, homemakers, lawyers...everybody!!! I like the sentiment. A family of educators is a special thing. Keeps everyone on their toes! 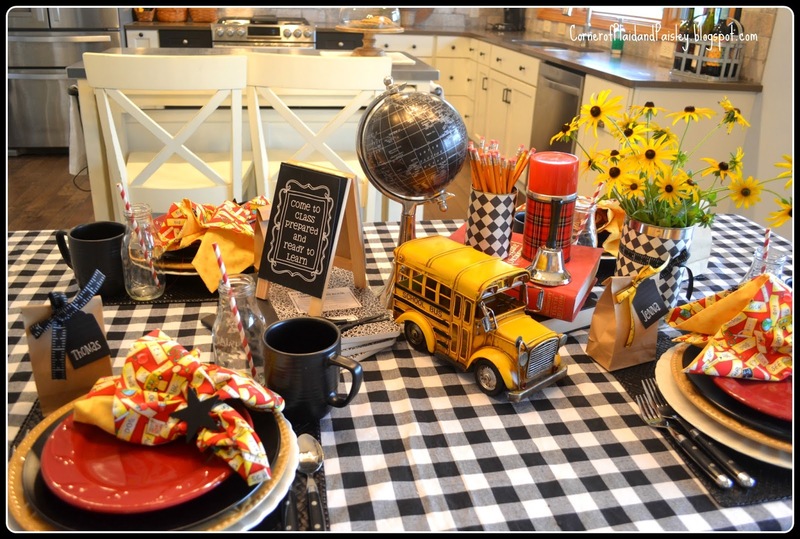 Cool tablescape with fun touches, especially that school bus!!! Have a great weekend! Really cute! Love to know where to find that cute school bus. Our kids are long grown now, but love all the back to school memories, including even my own so long ago. I found the school bus at Home Goods a couple of weeks ago. It was one of those things that just screamed take me home! What is perfect table for back to school. 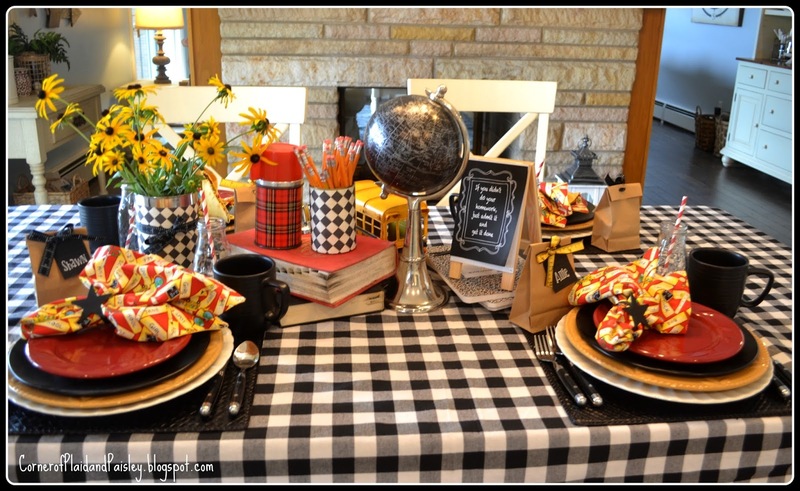 Love the black and white check tablecloth, it really ground the table. 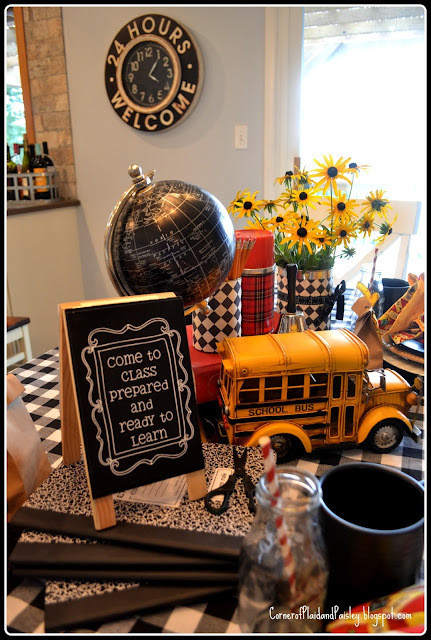 This is just so cute, love your details and especially the bus and chalkboard. I was a teacher for 38 years so really appreciate the sign. Hard to believe it's time for school again. 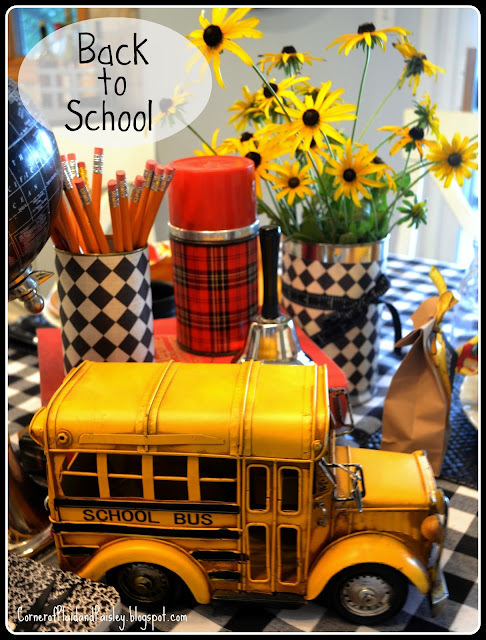 Love the cute little yellow bus and the black and white tablecloth -- I love checks! Happy Monday! 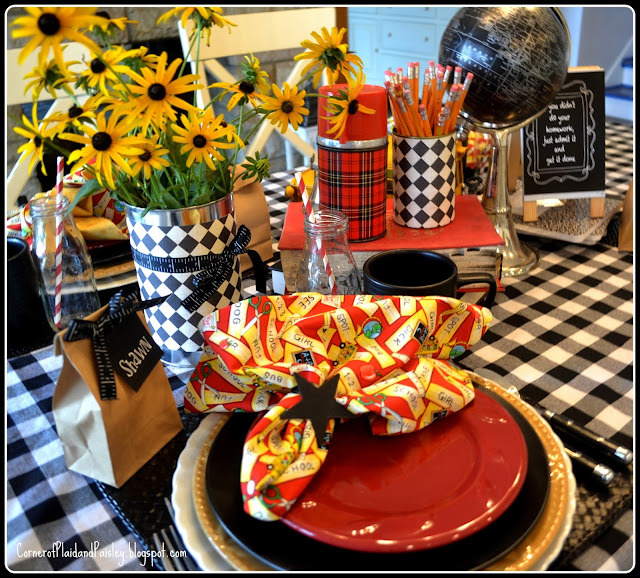 Ann, this is such a cute and fun Tablescape...so retro! I am sure you have enjoyed seeing your children become teachers Have a wonderful week!